Built in the 14th century, this is one of ceskykrumlov oldest buildings. Large Gothic and Renaissance makeovers in the sixteenth and seventeenth century. When you visit, ask the people there to tell you the legend of the pearl oyster boy - t's a very charming tale. Today the mill is a hodgepodge of different kinds of attractions. The historical water turbine room…. 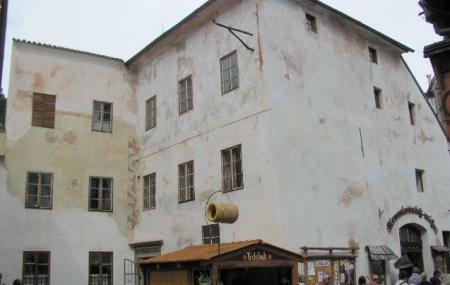 How popular is Krumlov Mill? People normally club together Egon Schiele Art Centrum and Regional Museum Cesky Krumlov while planning their visit to Krumlov Mill. Nice little restaurant with great views of town square. Food was OK, prices reasonable. The guys restroom was interesting! The food is ok. Noting special. Nice ambient. Upmarket price. Service is so so. Big restaurant, soup is oily a bit. Main dish is normal. Dessert is look great but nothing. Ideal place if you need a boost of self-loathing. We saw the poor reviews but really wanted to eat at the riverside after having seen how picturesque it looked from the castle heights. We made a mistake. Their prime location allows them to ignore good service and food. Staff are indifferent at best, and maybe that's because they're embarrassed by what they're carrying to the tables. The food isn't disgusting, but mediocre would be a compliment. When you see what you have to pay for such low quality, it may ruin your day in the quaint charm of the old town. You'd be better served by any other restaurant here. Or that half a granola bar that's been rolling around mom's purse for the better part of the week.